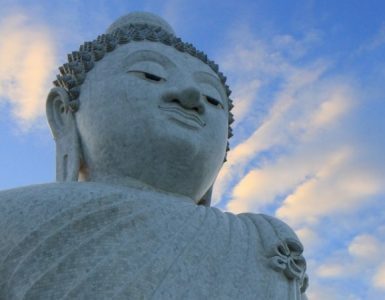 Phuket is a city of history and tradition, one of the most important evidence of the cultural heritage are the temples. The largest and most famous temple in Phuket is Chalong Temple, also called “Wat Chalong”. This temple is famous thanks to its, “Healing Therapy” that was practiced a long time ago by 2 former abbots. Today, the temple is one of the most visited by locals and tourists. Chalong Temple has especially been revered due to a relic named Phra Borom Sareerikatat and kept inside a glass case on the top of the 60 meters high Phra Mahathat Chedi. The relic was brought over from Sri Lanka and was set up in the chedi by HRH Crown Prince Maha Vajiralongkorn. The walls of the Chedi feature mural paintings depicting scenes from the Jataka, an Indian Tale about the previous lives of Buddha. One of the temple’s halls features a gilt-covered statue of Luang Poh Cham, the former Abbot of the temple. Several legends mention Luang Phor Cham’s walking stick, that is believed to hold healing powers. Therefore, many people said they were cured of stomach aches after being touched with the stick. The hall also contains statues of Luang Poh Chuang and Luang Poh Gleum, all ex-Abbots of the temple. There is also an air-conditioned ‘exhibition home’ of Luang Poh Cham, showcasing antique Thai furniture and Benjarong (Thai porcelain designed in five colors). Some dress code rules have to be respected when visiting this Buddhist temple. First of all, women are required to cover their shoulders and wear pants or long skirts. Also, shoes are never allowed inside a temple. A certain level of respect is expected: speak in a quiet tone within the temple and don’t touch the statues or other Buddhist relics. How to get to Chalong Temple? Chalong Temple is located almost 30 kilometers from Novotel Phuket Surin Beach Resort. You can get there by taxi or tuk-tuk. The trip is around 40 minutes. You can book a round trip tour, in which case the driver will wait for you to bring you back to the hotel. For more information, please contact tour desk at Novotel Phuket Surin. Chalong Temple opens every day from 7.00 A.M. to 5.00 P.M.